Not on stages with loudspeakers, not in the role of leaders or dictators, but in the role of a human wall between citizens expressing their civil discontent and the police tasked with maintaining public order – this is what the role of politicians, priests and Armenian celebrities look like during current civil protests. After the violent breakup of their protest on Tuesday morning, thousands of civil activists regrouped and gathered again in Baghramyan Avenue in central Yerevan last night to continue their campaign against rising electricity prices. Activists’ standoff with police continued into Wednesday as they barricaded themselves with dustbins. Unlike the day before when no politicians were seen among the protesters, in the small hours of Wednesday both opposition and pro-government lawmakers appeared in the epicenter of the events. “The wall is built with one aim and one slogan: violence must be excluded, none of the parties should apply force,” Pashinyan said. A number of prominent Armenian politicians and public figures responded to the appeal. 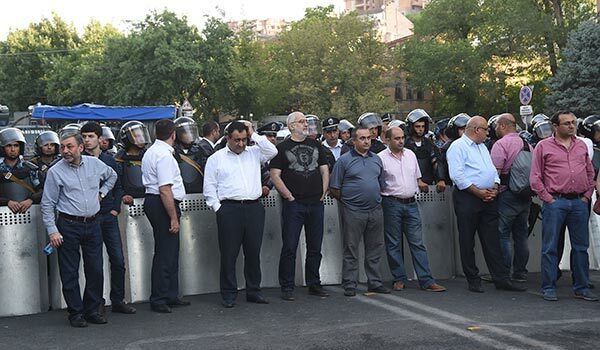 Even some representatives of the ruling Republican (RPA) party, including Minister of Education and Science Armen Ashotyan and MP Samvel Farmanyan, came to Baghramyan Avenue during the night. However, the civil activists were clearly irritated by their appearance as they demanded that the pro-government politicians leave. Meanwhile, former MP, political analyst Stepan Safaryan said he was glad about the fact that Ashotyan and others were on Baghramyan Avenue. “It means – 1. The police will not take up any measures tonight (a decision on the highest level was made), the youth and the people will be safe and in the territory they occupy 2. The government is quite scared by the movement and by the international community, and it is trying to find grounds of communication with the movement, especially after the proposal for negotiations was rejected twice. 3. [President] Serzh Sargsyan will meet the demand, thus there he needs people who will welcome a constructive and negotiating president,” the political analyst wrote on his Facebook account. Wednesday morning was calm on Baghramyan Avenue where activists together with opposition MPs Pashinyan and Tevan Poghosyan were cleaning up the territory of the boulevard after the night. Early in the morning Armenian Deputy Chief of Police, Colonel Hunan Poghosyan said that the police will not take up any special measures for now because the protest is of a peaceful nature.